We'd like to give a warm welcome to Claire!! Be sure to visit her blog and leave her some love!! This is my first post of two as a guest designer for Sweet Stamps - they make beautiful digi stamps and I am super excited to be working with two of their fun stamps. I chose the fun Denise Glam Girl stamp for my first project. Before I start 'building' a card, I like to lay the elements out and see how they will work. Here's a rare photo of that process. What can you see? A shaker pouch, a card blank, three pieces of card, friend die and sentiment stamp. The Denise stamp reminded me of a good friend, so I decided this card should be for her. I really enjoyed colouring the stamp and the great thing about digi's is that I get to print a sheet of them and try out various colourways before choosing the final one, then I still have a sheet of coloured stamps ready to go for later. I fussy cut the stamp, as I wanted her to sit on the front of my shaker card. Constructing the card was very easy to do. I love the girly, but funky feel of the card. I know my friend will love it too. Visit the Sweet Stamps store, to check out Denise and all the other fun stamps and products that are available. I'll be back with my next project soon!! Claire, we are happy to have you as a Guest Designer!! 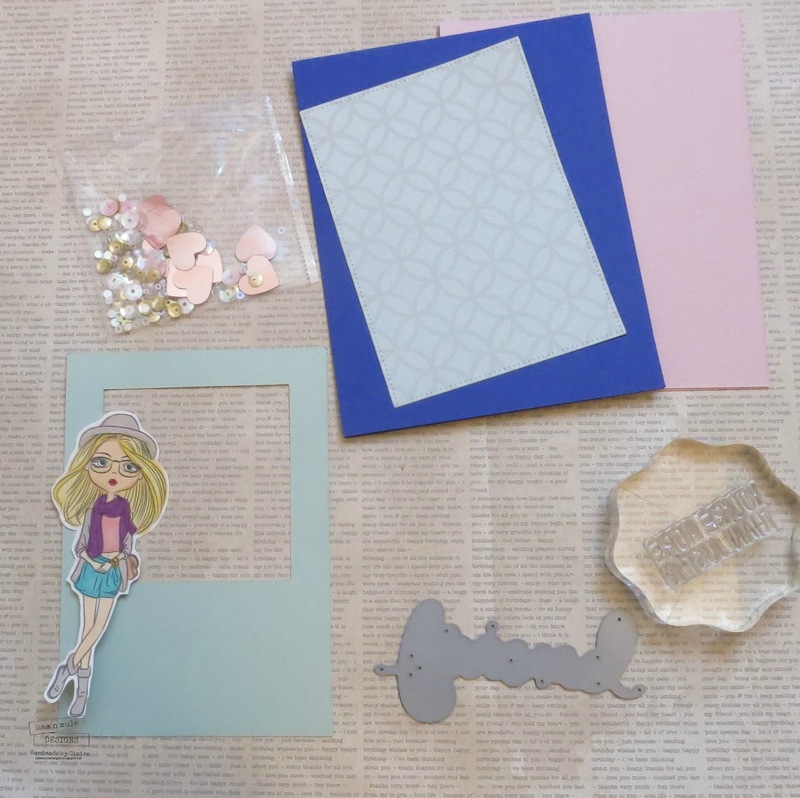 We absolutely love your pretty shaker card you created!! Beautiful coloring on Denise, love the shaker card and how the circle pattern shows through the window. 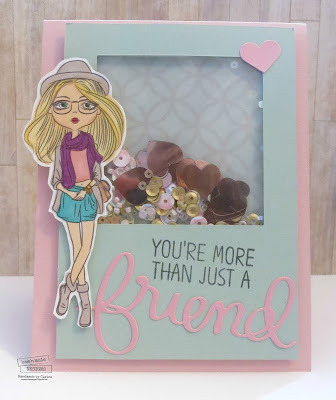 Thank you for sharing your talents with us at SweetStamps.com this week. Looking forward to your next project. Adorable card! I love the shaker window and the Denise image is so sweet~great coloring!